Make a difference in the life of a rescued farm animal! Has a special someone at Happy Trails captured your heart? Can’t adopt, but still want to do something meaningful to show your support? Become an Animal Sponsor Today! Animal Sponsors play a critical role at Happy Trails. Many of the animals have special needs that require extensive care and rehabilitation. The Sponsorship Program allows supporters to contribute to the cost of food, shelter, and veterinary care for farm animals and horses rescued from situations of abuse, neglect, and abandonment on a one-time or ongoing monthly basis. These contributions directly support our mission, and we could not continue this vital work without you! Sponsors receive a welcome packet with a color portrait of their sponsored animal, information about the animal’s rescue and personality, and a fact sheet about the animal’s care. Happy Trails also offers many opportunities throughout the year for Sponsors to meet their special animals in person! This is really up to you. A sponsorship can be a one-time payment to support an animal’s care for one month, or on-going monthly payments. You can also choose to purchase a gift sponsorship for the holidays, or to commemorate a loved one’s birthday, wedding, or other special event! Absolutely! Any animal available for adoption is also available for sponsorship. Our permanent residents need Sponsors, too! If you don’t have a preference for a specific animal, don’t worry. We can choose one for you! What happens when the animal is adopted? You can choose to cancel your on-going sponsorship, or simply transfer it to another animal in need. Payments can be made online with a Visa or MasterCard. For your convenience, there is an option to set up recurring payments; your card is automatically charged every month. You can also choose to download our sponsorship form and mail it in with a check. Have more questions? 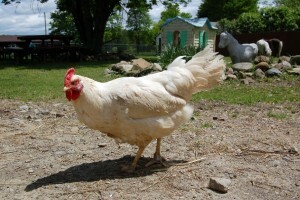 Contact the office at info@happytrailsfarm.org.